We had so much fun during our “Full S.T.E.A.M. Ahead February” that we want to keep the momentum going! From now through April 1st you can enter to win one of several prizes that we are giving away. 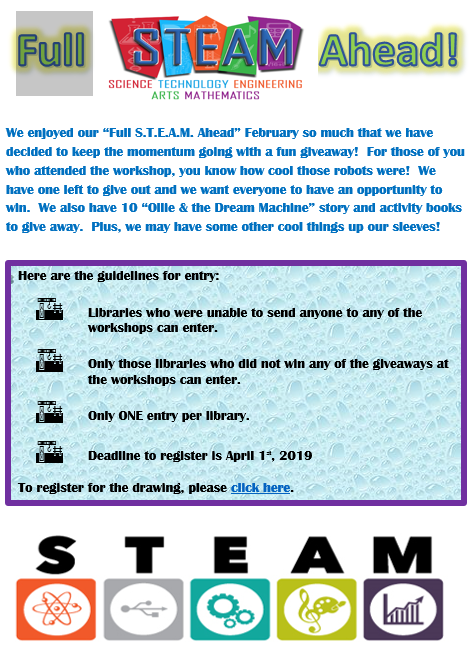 If you were not able to attend any of the workshops in February or you were there but did not win any of the prizes, you are eligible to enter your library in for a chance to win! One entry per library please! For more details, click here and to get registered, click here.